Much like the last film in our countdown (ROPE), this movie is notorious for its setting and atmosphere. LIFEBOAT is different from Hitchock's usual crime thriller. It's a war movie that follows a group of survivors who are stranded out at sea. 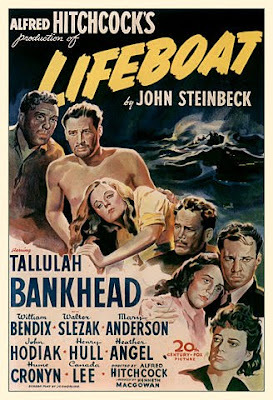 During World War II a group of American and British citizens are stuck in a lifeboat after their ship and a U-boat sink each other in combat Survivors from the freighter torpedoed by a U-boat huddle together including columnist Constance Porter, the ship's engineer Kovac, radio operator Stanley Garrett, nurse Alice MacKenzie, millionaire Charles 'Ritt' Rittenouse, seaman Gus Smith, steward Joe, and Mrs. Higley, a hysterical English woman holding her dead baby. Though the inhabitants of the lifeboat come from vastly different backgrounds, they quickly set aside the social and economic differences that divide them in a united effort to survive. Explaining the plot further would just ruin the whole thing, so I'll just leave it at that. Basically you're stuck watching these people trying to survive out at sea. Just the thought of being stranded out in the ocean is scary. Trying being in the middle of war while it's happening. These elements together create paranoia, and that's just one of the reasons why we love this movie. What makes LIFEBOAT stand apart is its character development and dialog. LIFEBOAT runs at a pretty good pace and at 91 minutes total it doesn't ever seem to drag. The story comes from John Steinbeck, the author of such stories as "The Grapes of Wrath" and "Of Mice and Men." Trying to fit a group of actors in one place can be a challange, and it's remarkable that Hitchcock was able to get it down. For such a small frame Hitchcock managed somehow to fit a good number of characters on screen at the same time. If you haven't had the oppertunity to see LIFEBOAT yet, then I suggest adding it to your Netflix cue right away. Especially if you're a fan of the movie ROPE. The film is so good that it received Academy Award nominations for Best Director, Best Original Motion Picture Story and Best Black and White Cinematography. Some critics see this as an unsubtle wartime propaganda piece; I call it a great achievement in cinema. 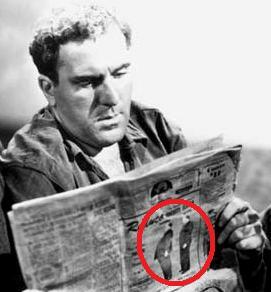 LIFEBOAT's portrayal of a German character (was perceived as a positive fashion) caused considerable controversy at the time of its release. Looking back at it now, I don't think that's entirely true. Go see this movie! CAMEO NOTE: How can Hitchcock make an appearance in LIFEBOAT without having to play a character on screen? That's easy, just read the newspaper. 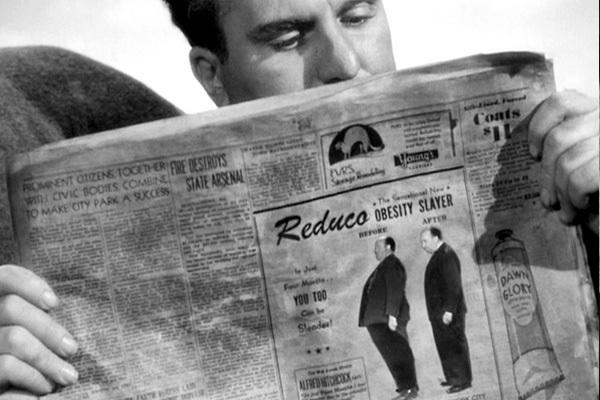 25 minutes into the film Hitchcock's body is seen in the "before" and "after" newspaper ad for "Reduco Obesity Slayer".